Which 2018 Toyota Tundra Is Right for You? The 2018 Toyota Tundra is incredibly spacious and has solid off-road capabilities. This makes it ideal for someone who needs a truck for work and play. While some trims focus solely on performance, others want you to tow as much as possible. Which trim is right for you? The 2018 Toyota Tundra SR is the base trim and starts at $31,120. It comes equipped with a strong 4.6-liter V8 engine that’s capable of 310 horsepower and 327 lb.-ft of torque. Because it’s such a powerful engine, drivers can expect fuel economy of 15 mpg in the city and 19 mpg on the highway. For those concerned about how much work you can get out of your Tundra SR, this trim is capable of a 2,080-pound payload and 10,500-pound maximum towing capacity. If you’re planning on using it as a family vehicle, it may be best to upgrade to another trim. The SR trim only has seating for three. With that being said, it’s ideal for work or for someone who has no need for expansive passenger space. New for the 2018 model, all trims come with Toyota Safety Sense standard. This adds safety features that make it much safer for drivers and passengers alike. Toyota Safety Sense includes a Pre-collision System with Pedestrian Detection, Lane Departure Alerts with Sway Warning System, Automatic High Beams, and Full-Speed Dynamic Radar Cruise Control. The SR5 starts at $32,830 and is an affordable option for families. It has enough seating for six passengers but with lower towing and payload capabilities as the SR. The SR5 has a maximum payload of 1,600 lbs and a towing capacity of 6,800 lbs. Because it has the same standard engine, it also gets the same fuel economy, so you’re gaining a lot of features for a small price increase. On the inside, the SR5 upgrades the infotainment system to Entune Audio Plus with Connected Navigation App. This allows you to access navigation through your phone using the Navigation Scout GPS Link App. The Limited has the first major engine upgrade for the 2018 Toyota Tundra. For $40,385, this trim comes with a 5.7-liter V8 standard engine that can produce 381 horsepower and 401 lb.-ft of torque. With this upgrade, the Limited increases the maximum payload to 1,670 pounds and towing capabilities to 10,100 pounds. On the inside, the interior also experiences a few changes that include Entune Premium Audio with Integrated Navigation. This allows for better sound, which plays through nine speakers that are located around the cabin. Additionally, the integrated navigation provides predictive traffic and Doppler weather overlay. You’ll never be caught off guard by inclement weather. The Platinum is a stellar choice for anyone looking at the Toyota Tundra. It comes with plenty of features that make it luxurious to drive in all seasons. During the summer, drivers can turn on the ventilated front seats. Cooler seasons allow drivers to use the chrome heated side mirrors for safer driving, as well as a reason to turn on the heated seating for a comfortable drive. Finally, the Platinum comes with Entune Premium Audio which features 12 JBL speakers, a subwoofer, and amplifier. The only drawback is that the Platinum has a maximum towing ability of 9,500 pounds. That’s less than the Limited and SR trims. The Platinum has the starting MSRP of $47,080. If the Platinum doesn’t strike your fancy, the 1794 Edition just might. It even has the same MSRP of $47,080. There aren’t many differences between the Platinum and the 1794 Edition other than the fact both have unique stampings either labeled "Platinum" or "1794 Edition." It’s all about looks when you’re trying to choose between these two trims, although the 1794 definitely has a more rustic Western vibe due to the different color choices and wood-style trim interior. If you’re willing to pay an extra $35, you can upgrade your 2018 Tundra 1794 Edition to include the TRD Off-Road Package. This package upgrades standard wheels to 18-inch, split 5-spoke, alloy wheels with black accents and all-terrain tires. The shock absorbers are trail-tuned Bilstein, and skid plates help prevent damage to the underside while going off the beaten path. Another package that is brand new is the TRD Sport that will provide some significant changes. The wheels are upgraded to 20-inch, 6-spoke alloy, and the Bilstein shock absorbers make a return. 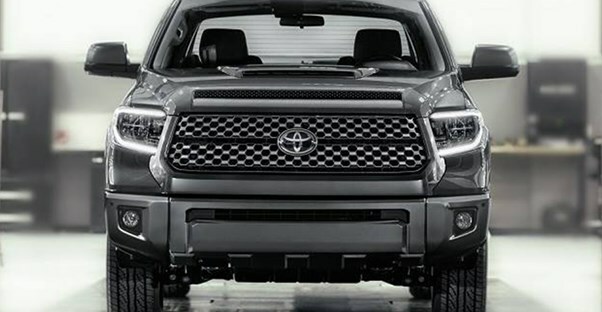 The front grille is updated to have a honeycomb-style, and TRD Sport emblems make your Tundra unique.